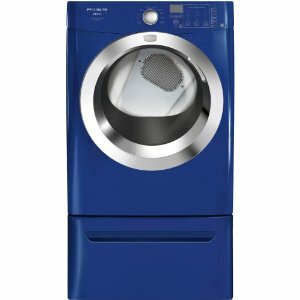 The FASE7074LN is another model on the extensive line of dryers manufactured by Frigidaire. Some of this model's features include DrySense Technology, which dries clothes and other items more precisely, reducing the amount of wrinkles. It also has Ready Steam, which generates steam, a time-tested way of giving dried items a more refreshing smell and look, with fewer wrinkles. The dryer's machinery is filled with convenient features. Among these features is NSF Certification, brought about by the 'Sanitize' temperature settings which ensures all finished products to be free from any germs and bacteria. For its capacity, Frigidaire gives this model an Ultra-Capacity Dryer classification. With the Specialty Cycles this model is equipped with, users can dry many different kinds of items. Easy loading and unloading can be done with the reversible door, which is lined with chrome, assuring strength and ease of cleaning for its users. The blue exterior of this model is something unique. Specialty options of this model are not just present for show, as they can really be proven useful to users. The extra cycles allow for special items to be accommodated. Other features such as anti-static and Sanitize temperature settings prevent unwanted laundry results such as static and items with allergens. Thus, it has an NSF certification. Not only will users save time and effort, this model also has an Energy Saver option that cuts the use of energy, which also means savings in resources and money. The manufacturer deems it as a Fits-More dryer, which means that among dryers of its size, this model offers the largest capacity, which leads to more loads to be dried. Compared to other dryers available in the market, the price of this dryer model is noticeably higher.